The old Foss farm came with a great old dairy barn. We keep our dairy goat herd in the barn. 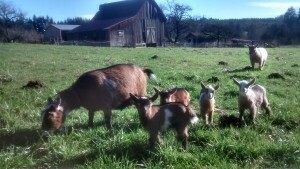 Minni and her kids on pasture, just weeks old. However, the barn needs a preservation project. The barn needs about $30,000 in work if it to remain standing. We have been award a Heritage Barn Initiative Grant. These grants require a 50% match so we still have some fundraising todo. But with the backing of the Washington Trust for Historic Preservation and the Department of Archaeology and Historic Preservation we will start work in the Spring of 2019. We hope to have the barn finished before hay season. We are planning another barn-raiser fundraiser for 2019 date TBD stay tuned! 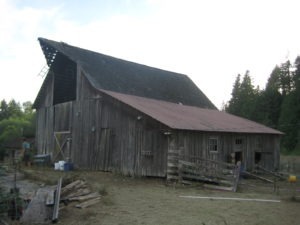 Please check out our Heritage Barn Preservation Project page for the details. We area asking people to donate via our Go Fund Me site. Here is the link https://www.gofundme.com/thesmithshyre. Thank you in advance for donating to our cause. Barn and Impressive Maple in the mist. 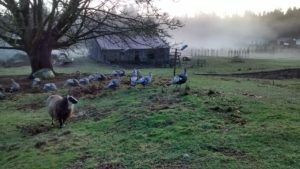 I have great blog post about the barn, its history and so forth click the link to check it out.